Not quite as refined as the stories in Unaccustomed Earth, but still a good portion of before-sleep reading. 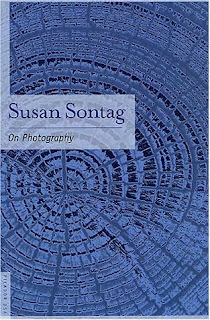 Passed by the great (yeah well, the best) Stockholm book/mag/music/dvd store Papercut the other day and found that Penguin has published Susan Sontag's On Photography recently. A small paperback, minimalist design, a nice matte cover. 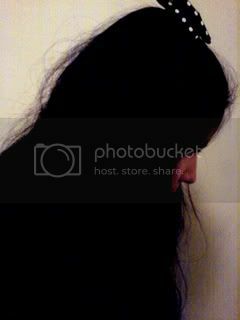 However: rather tightly bound/excessively glued (would most probably result in a cracked back shorly after opening it). My bookshelf already carries some Sontags in Picador's larger paperback format, and it seems like most of her writings can be found in that series. The print is not great, in fact sometimes quite wobbly and uneven from one line to the other; the paper quality gives the books a feel of being at least 30 years old - they seem floppy and cheap, like a soft pack of cigarettes that's been in your back pocket for a few days (nights). And yes, the paper is yellowed, as if by a persistent nicotine intake in and around these thingies. So what's more important? Looking cool while reading in the Subway (i.e. challenging one's fellow passengers with that piercing look) vs. sporting an unshapely but neat, NE-like collection of Sontags in the shelves of the near future? The thought of something like this will, I suppose, always win in the end. 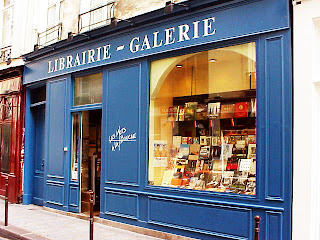 In my dreams, all my shelves look like something from a librairie consisting of solely Èditions de Minuit. As Café Edenborg was closing, they had all books on sale (except the Vertigo ones). And between Nanna Johansson's Fulheten that I've been wanting to get for a long while, a Tafdrup that seemed nice, the newly translated version of Kafka's The Trial and some novel about masculinity (! ), Loka Kanarp's comic book album from 2006 caught my eye. Why haven't I read it before? I've been reading her great blog for at least a year, her contribution to the Samtidigt anthology and the comics in Hjälp. 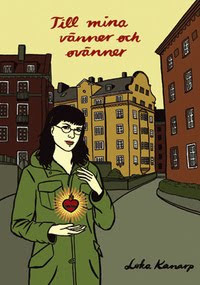 Some of the stories in Till mina vänner och ovänner (To My Friends and Enemies) remind me a lot moodwise of my favourite Adrian Tomine - however told from a feminist standpoint, which of course, is a plus. Broken hearts and friendships, working at Mc Donald's, turning hetero and the stuffed animals at The Swedish Museum of Natural History (that I recently visited, seeing the same things) - it all makes for a great read. In September Loka's new album Pärlor och patroner (Pearls and Bullets) will be out, a collection of single page comics on the subject of historical women. I'm looking forward to that one a lot. Oh, and I forgot to mention: Loka is a wonder of style. Look here. And I am, as always, in awe of Nilsen's long running series Big Questions. 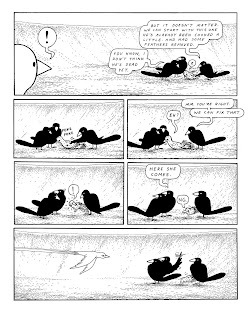 One issue/20-30 pages per year, as it's been the past few, is never enough but still quite - it is with the tiny gestures; the turning of a head, the widening of an eye, that Nilsen's drama becomes what it is. Perfect. as he had wanted, and as he had written in a poem many years prior to that day. 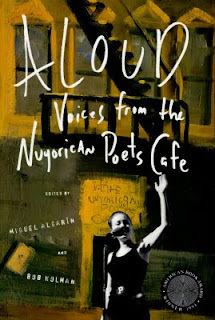 Earlier today I vividly remembered cherishing that foreword, as the Nuyorican came to symbolize for me a place where everyone and everything was possible, disregarding of (for example) race and gender. The kind of place that I never got to be part of then, but that I actually would find in Café Edenborg some ten years later. Since 2004, Edenborg has been my second home, the place where I've read, worked, hung out when I had nothing better to do. 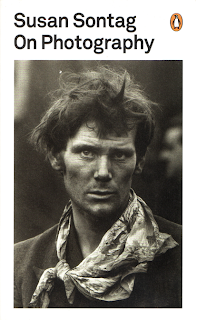 And I have gotten to know an extraordinary bunch of people, both the ones working and other regulars. People who I've wanted to share my world with, while everyone outside the café seemed biased, racist, homophobic or just plain out of their minds. This evening at 7, when Mr. Edenborg made everyone leave the café so he could close the door and symbolically lock up for the last time, there were many with me who couldn't stop crying, scattered and shattered out on Stora Nygatan. An inconsolable group who have spent hours and hours together in that room. This is the end of an era, and I have no clue what to do now, except for thanking everyone for all these years, and for the honourable award of Best Regular. Thank you Shenge, Evis, Siri, Sofia, Danne, Sara, Elias, Amanda, Carl-Michael, Caroline, Viktor, Chia, Aurora, Frida, Jessica, Elli and Hanna. For everything. I love you more than. 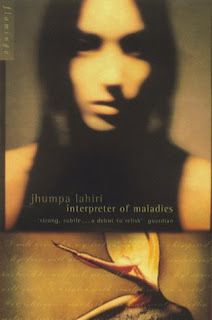 (*) A book that I happened to find in my beloved friend Patrik's bookshelf many years after, to my great surprise (considering the fact that we were living in Sweden and that it came out in 1994). Sadly, Patrik is no longer with us, but I somehow know that we had a special bond that came out of owning that exact book; like we were from the same block philosophically, or had similarly coloured dreams or something. 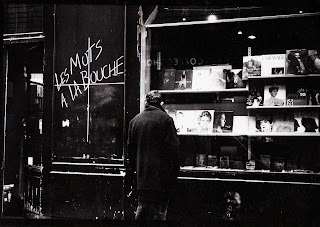 Les Mots à la bouche is my favourite bookstore in the Whole. Wide. World. It is on my favourite street corner in Paris: rue Sainte-Croix de la Bretonnerie and rue Vieille du Temple, in Le Marais, 4:ème arr. 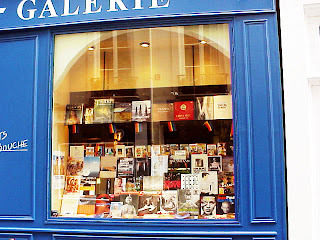 Les Mots is packed with books, LBGT-themed and others, and they always seem to carry the top 5 books I've been looking for lately; classics as well as new stuff; everything neatly organized. They have a great wall of magazines, too. And a basement. At the moment all I want is for that wonderfully nice staff to start selling tote bags with their logo, in the appropriate blue colour. It would be perfect in my collection, and I would carry it everywhere with me, showing it off. L'étoile manquante (a great hangout café/bar with an otherworldly salad of fresh fruits and cheeses with mustard dressing - Salade d'Ètoile). 8 shorts by Sontag, most of them deconstructive in some way. Personally, I enjoyed Project for a Trip to China, a sort of collection of lists, quotes and tables all on the subject of traveling to China / whether or not the protagonist could have been conceived in China; and Debriefing, a restless portrayal of the relationship of two friends, ending with death. In the future I will try to get hold of this book (on the page quoted, Sontag talks about Debriefing). [...] You don't just die, as Simone de Beauvoir points out in her beautiful memoir, "from being born, nor from having lived, nor from old age. You die from something." 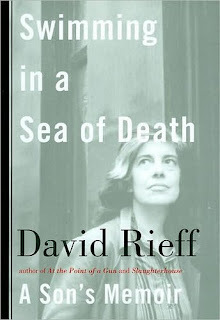 "While I was busy zapping the world with my mind, my body fell down"
Rieff explains the guilt of the survivor, the unanswerable questions one poses to oneself, even long after the loved one is gone. The thought that it would have been easier to die oneself, which of course would be less about making the ultimate sacrifice than it would be about making it easier for oneself. "leukemia: the ony clean death from cancer, the only death that can be romanticized"
The truth had been far from it. Listen to NPR's program about the book and read the first chapter or so. 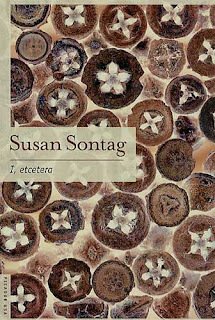 Read an excerpt from Sontag's diaries 1947-1963 here. UPDATE: I found this great talk held by Rieff over at Fora.tv!